ANOTHER SUPER EASY DISH COOKED IN THE CROCK POT THAT SERVES UP PLENTY OF FLAVOR! 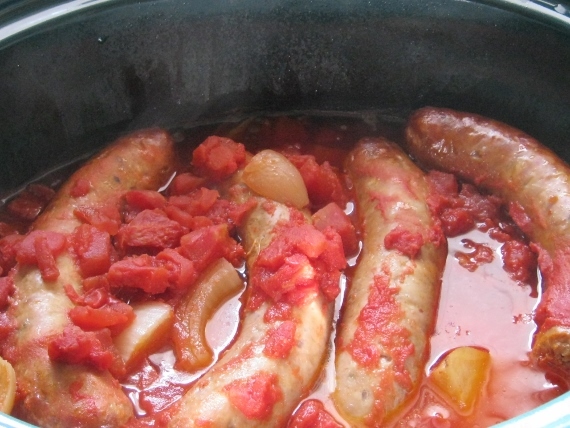 Place vegetables in the bottom of the crock pot with the sausage links on top. Pour the diced tomatoes over the top and cook on LOW for 6-8 hours. Cut the links into chunks and serve in bowls with some shredded Italian blend cheese or Parmesan. I LOVE EASY – ONLY 5 INGREDIENTS – AND COOKING IN THE CROCK POT KEEPS THE HOUSE COOL IN THE SUMMERTIME!